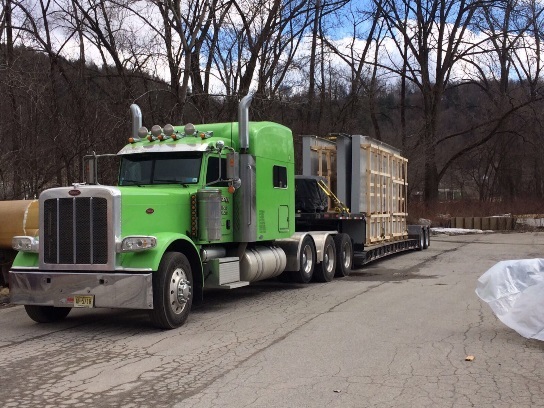 UK Flood Barriers is blazing a trail in flood resilience at home and in the US, where the company recently installed the first self-activating flood barrier in New York. Andy Walker spoke to the firm’s chief executive, Frank Kelly. Since being established in 2007, UK Flood Barriers has grown to become one of the UK’s leading specialist flood contractors, project managing multiple high profile contracts across domestic property schemes for both public and private sector organisations at any one time. Based in Worcestershire, UK Flood Barriers chief executive, civil engineer Frank Kelly, had witnessed first-hand the misery that flooding causes which led him to set up the company with the express aim of sourcing and installing the best flood protection products on the market. The company’s USP says Kelly lies in being able to provide innovative and cost-effective flood barriers in a market where few have specialised in that field. “Truthfully, in the flood defence market there’s not many specialist contractors,” Kelly tells me. “We carry a design and build team so we are traditional contractors but we got out of it in 2007 to specialise in flooding. It’s on cost where we add value. Most manually operated defences have to be put up ‘just in case’ so the lifetime cost is literally unquantifiable. Our system has zero operational cost and minimal maintenance because it’s stored underground constantly. There’s no UV deterioration and it’s vandal proof so it’s a passive, lifetime cost zero product and price comparable to any system out there,” says Kelly. The company’s success in securing work in the US came as a result of an internet search. “After Hurricane Sandy hit in 2012, we were approached by Ennead Architects, who work directly for New York University, who had been looking for innovative flood defences on the internet,” says Kelly. “They wanted to know what was on the market outside the US and they reckoned we stood out. 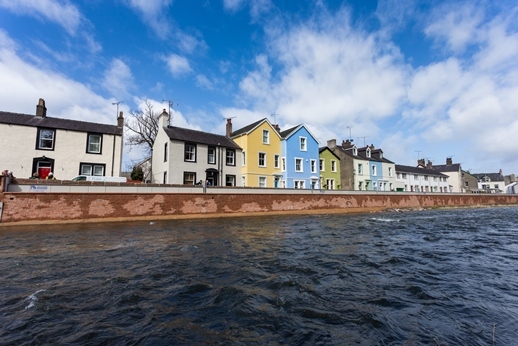 As young as our company was, we’d had our systems tested by Bristol University and we were right at the forefront of passive flood defence,” says Kelly. “We had proven products that had been used and at the time we had also just completed the biggest passive system in the world in the UK for the Environment Agency at Cockermouth. Ennead invited us over and we started working with them pretty much from the get-go. They wanted a passive system with no power, no human intervention and literally zero operational cost,” he says. UK Flood Barriers started working with Ennead and redesigned the foundations of a number of the large projects they were working on and things have moved on since then. “We now have the US Army Corps of Engineers working with us and we are doing design work for the Holland Tunnel in New York and lots of other different projects, which is quite nice for a little company from Droitwich,” says Kelly. 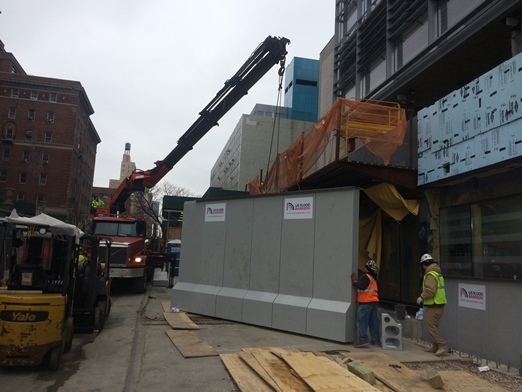 In March this year, Kelly’s company installed the first self-activating flood barrier in New York to protect the brand new New York University Kimmel science block and medical centre on the banks of Manhattan's Hudson river. The company was originally engaged in 2016 by US contractor, Turner Construction to install the self-activating barrier at the university site. As part of a campus transformation project, the NYU science building is a new facility encompassing more than 365,000 square feet and 10 floors of laboratory space dedicated to medical research. “I’m really proud to be partnering with US manufacturers and suppliers to introduce this world-beating British technology to the US flood mitigation sector,” says Kelly.” The 30m-wide self-activating flood barrier installed at the science building will be ready to deploy at all times, providing 2.5m high flood protection to the main entrance of the new building. “The barrier is self-contained underground when not in use, bringing the benefits of minimal maintenance, being vandal proof, having no restrictions to vehicle or pedestrian access and having no costly storage and delivery charges in times of flood,” Kelly explains. 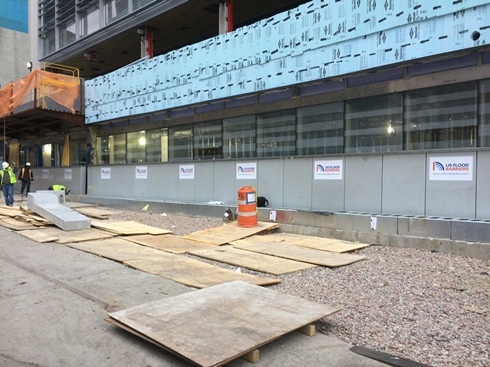 The project has been several years in planning and getting UK Flood Barriers involved in the early design stage allowed the building’s foundations to be designed to include the installation of the self-activating flood barrier. 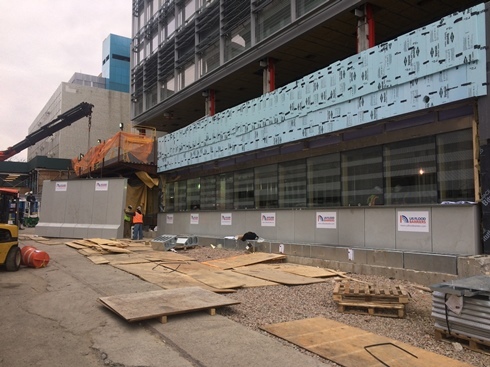 A second 68m-wide barrier is also being installed at NYU Langone Kimmel Pavilion, a new state of the art hospital/medical facility due to open in 2018. 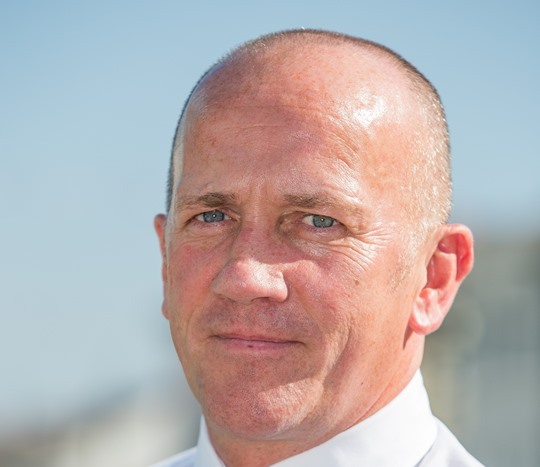 As well as being passionate about his company and the work it does, Kelly is also an advocate for the wider flood defence sector and in helping people protect themselves against flooding. He was a prime mover in setting up the Flood Advisory Service, a not for profit organisation offering free, independent advice on flood mitigation solutions to high-risk communities. “In 2010 I saw that the biggest issue for property level protection in the UK was the total lack of awareness by the general public of what is available,” said Kelly. “I tried to persuade the Environment Agency that setting up an advisory service was a good way of getting homeowners to protect themselves because if you give people the right information they will take action. Things continued on but nobody would back it so in 2015 I stepped in and agreed that UK Flood Barriers would be the primary sponsor of the Flood Advisory Service because I wasn’t waiting any longer for it to happen,” he says. Kelly is clearly proud of the work of the service. “In one year the Flood Advisory Service came into contact with and helped over 30,000 people at a cost of less than £3 a person,” he says. “The Flood Advisory Service is there to help homeowners and make them aware of any British Standard kite marked product. It is there to push standards because one of the key issues in this sector is a total lack of regulation and standards,” Kelly says. Kelly and UK Flood Barriers are also key players in the UK Flood Partnership, an organisation set up to support the growth of a high quality, UK wide flood defence industry. Providing a unique forum for engagement, the partnership was the first ever attempt to bring together like minded organisations to help tackle flooding. “Historically our sector has been extremely fragmented and what you had was small manufacturers who had no understanding of construction that were very protective of their products,” says Kelly. “What I wanted to do was bring the sector together and last year we started getting really good traction with Arup, Royal Haskoning, Atkins and loads of the other big players that wanted to learn how small companies were getting involved in big projects around the world. The EA and Defra came on board the steering group and things have progressed from there,” Kelly says. Looking to the future, UK Flood Barriers’ acquisition of Sunderland-based Arktek’s Flood Division is a real statement of intent. The Arktek Flood Defences team will operate under the newly formed UK Flood Barriers Northern brand securing and delivering projects in the north east and north west of England and also Scotland. “Our partnership with Arktek is a critical component of our long term vision,” says Kelly. “As a company with a great pedigree and a growing reputation in the flood sector, they were a natural choice to take on responsibility for UK Flood Barriers Northern working out of their existing Sunderland offices,” he says. Looking back across the pond, the company’s success in America has led to the setting up of a US arm of the business, US Flood Barriers, with offices in New York. “The company will work in the US, partnering with US manufacturers and suppliers, to bring our world-beating technology to the forefront of US flood mitigation, so we are now proud to be able to state ‘made in America’,” says Kelly. The future certainly looks bright for the company with prospects for new business increasing rapidly. “I see flood protection as easily the fastest growing sector for the next generation worldwide,” says Kelly. It’s certainly the case that in Frank Kelly, UK Flood Barriers and the flood defence sector has a real enthusiast for the work that it does and the people and businesses they help.